Bebek Tepi Sawah is renowned for serving balinese cooked duck. The spices incorporated to this dish is always a staple in Balinese cuisine. The price point of this Indonesian restaurant is more on the pricier side but at least in my opinion it is worth every penny. 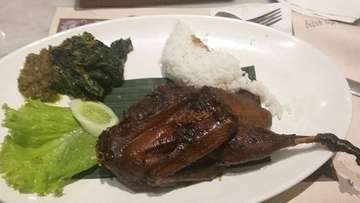 The signature dish, Tepi Sawah Crispy Duck priced at 100k has a huge portion and is definitely the go to dish at this establishment. However, rest assure that i have been to this restaurant a few times and tried several dishes, and the Ayam Bakar Bumbu Rujak priced at 75k is a great alternative (as long as you can handle spicy food). Overall a great place to bring your family, or to recommend to your expatriate friends! One of the safest choices when you are really hungry! Crush Level: Food (3.5/5), Service (4/5), Ambience (3.5/5) Date of Visit: 29/07/2016 I don’t think I need to get into too much detail to introduce this Bali-famous restaurant. Basically, Bebek Tepi Sawah is a restaurant that specialises in duck dishes, which was established in Bali years ago. Due to its popularity, the restaurant decided to enter the Jakartan and Singaporean market. My family and I went to visit one of the outlets at Citos, Jakarta when we were undeniably hungry (we skipped lunch, duh!). Luckily, it did not take a long time for the food to be served on the table. Food Tepi Sawah Crispy Duck (IDR 109K++) My sister opted for the dish, and she said the skin was incredibly crispy, and a savoury flavour seasoned the entire dish. Pairing it with the sambal made the duck more deliciously burning. 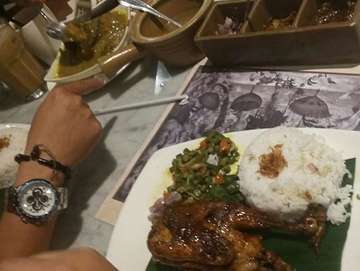 Bebek Asap Tepi Sawah (IDR 97.5K++) It was a source of excitement that your hands and tummy could experience. The meat was tender and absolutely well seasoned; sweet and savoury at the same time. The cassava leaves was a big win here as a side dish. Crunchy and flavourful! Sate Lilit (IDR 65K++) The satay was seriously tender and would make a great combination when paired with the kicking chilli sauce. But! When eaten by itself, it was intensely salty. The food was flavourful, but I don’t think it was divine or impressive. Maybe, it's because I had a higher expectation for this famous restaurant. On the other side, the service was considerably fast and friendly that Bebek Tepi Sawah would be one of the safest choices when you feel hungry. *Nona Tukang Makan was not invited or paid by any individual or business to write this review. The opinion stated is strictly hers.